Let us discuss some typical multiple choice questions on oscillations and simple harmonic motion. When the spring is cut in the ratio (of lengths) 1:2, the force constants of the pieces are 3k and (3/2)k.
[You should note that the spring constant is inversely proportional to the length of the spring. Therefore, when the length of the spring becomes one-third, the spring constant becomes three times (3k) and when the length becomes two-thirds, the spring constant becomes (3/2)k]. The frequency therefore becomes (1/2π) √(3k /2m) = √(3/2) f.
T = 2π√(m/k) where m is the mass of the cube and k is the force per unit displacement of the block. When you push the floating cube down through a small distance x, the additional force of buoyancy on the cube is equal in magnitude to the weight of the additional liquid displaced by the cube. This is vρg where v = extra volume of liquid displaced = a2x. Thus, the restoring force on the cube = vρg = a2xρg. [Note that the period of oscillation is 2π√(m/Aρg) where A is the area of cross section. This expression holds in the case of any block of uniform cross section area A]. T = 2π√(ℓ/g) where ℓ is the length of the pendulum and g is the acceleration due to gravity. The period of the pendulum is given by the above equation when the elevator is at rest and also when it is moving with uniform velocity. Since g = 10 ms–2, we have T = 2π√(ℓ/10). 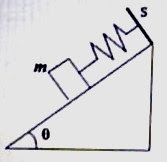 When the elevator moves up with acceleration (a) of 1 ms–2, the weight of the bob of mass m increases from mg to m(g+a) so that the restoring force on the bob increases correspondingly. The period of oscillation therefore decreases. In place of g the value (g+a) is to be substituted in the expression for period. T1 = 2π√[ℓ/(10+1)] = 2π√(ℓ/11) = 2π√[(ℓ/10) ×(10/11)] = T ×√(10/11). Therefore, the angular frequency ω = 6π. The linear frequency f = ω/2π = 3 Hz.